Massive flooding and widespread landslides in India have taken the lives of over 300 people and left over 300,000 seeking temporary shelter in relief camps. Thousands more are stranded on rooftops awaiting rescue. 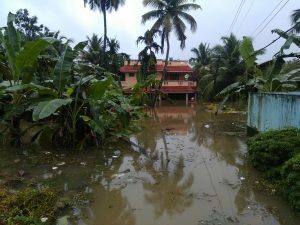 The state of Kerala is experiencing the worst flooding in living memory due to heavy rains continuing since July. For the first time in the history of the state, all of the gates for the 37 reservoirs had to be opened to release excess water which caused widespread inundation of rural and urban areas. If you would like to help, please give to the BGR International to support relief efforts.